Some fight to live another decade and new buildings are built around them. These L-shaped developments have become common in the last decade. Think of the Burgerville at Northeast Martin Luther King Jr. Boulevard and Northeast Multnomah Street near the Oregon Convention Center. One of the fast food company's best-performing stores, this Burgerville serves hungry conventioneers as well as drive-through commuters and families. There was no way they were going to give up the location, so Union Apartments was built around it. Not far east is the Sandy Hut, a dive bar on a triangle of land over which apartments now tower. As grungy spaces become desirable for new residents, it's hard to know how long such places can hold out. The Dockside, or a diner like it, has been opening in the wee hours (5 a.m. on Fridays, 6 a.m. Saturday and Monday through Thursday, and 7 a.m. on Sundays) since 1925. 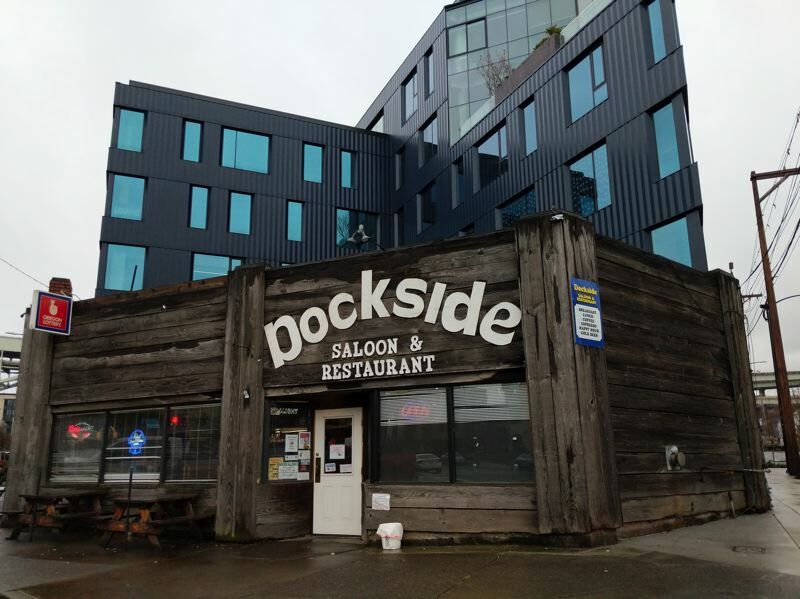 Named Dockside in 1986, (before that it was What's Up Doc and before that Dot's Sternwheeler) it served dock workers, truckers and night-shift workers in the industrial northwest who were heading home. "We hoped to buy that space, but couldn't," she told the Business Tribune. One previous developer "tried to squeeze us out with a ridiculously low offer," she says, but they held on. Then the land next door passed to the current owner. "He liked us and wanted us to stay." "We briefly talked about moving into the new building, but it's very costly for a business to relocate," Peterson said. "It changes everything. It can be the kiss of death. I've seen it happen. We're comfortable where we are." "I have no idea what the future will be like. I'm not saying we're busier or slower. When we had parking we had police officers, drivers for garbage trucks and PGE workers. Now they have to make an effort to find a place to park. A lot of our older customers have difficulty and can't walk long distances." As for the scrap of nose-in parking up front, she says "It's going away soon. We're going to put in sidewalks to gentrify it." The space formerly known as Touché Restaurant & Bar is housed in a 105-year-old former firehouse. The three buildings at Northwest 14th Avenue and Glisan Street were at one time set for demolition: the old Fire District No. 3 building (Touché Restaurant & Bar) and the nearby Hawaiian Time and Le Bouchon restaurants. The fire station survived. 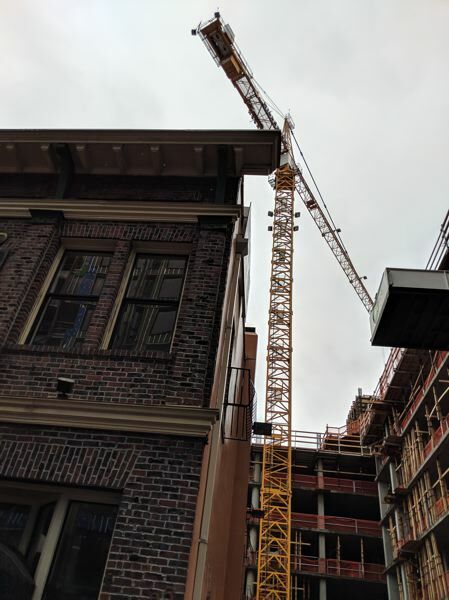 Sam Rodriguez, senior managing director of Mill Creek Residential Trust, owners of the site and builders of 55 residential towers all over America, at one point suggested taking it down and reconstructing the brick facade inside a new building. It's worth noting that only the brick façade is original. The building is not a Historic Landmark, but is listed only on the City's Historic Resource Inventory. 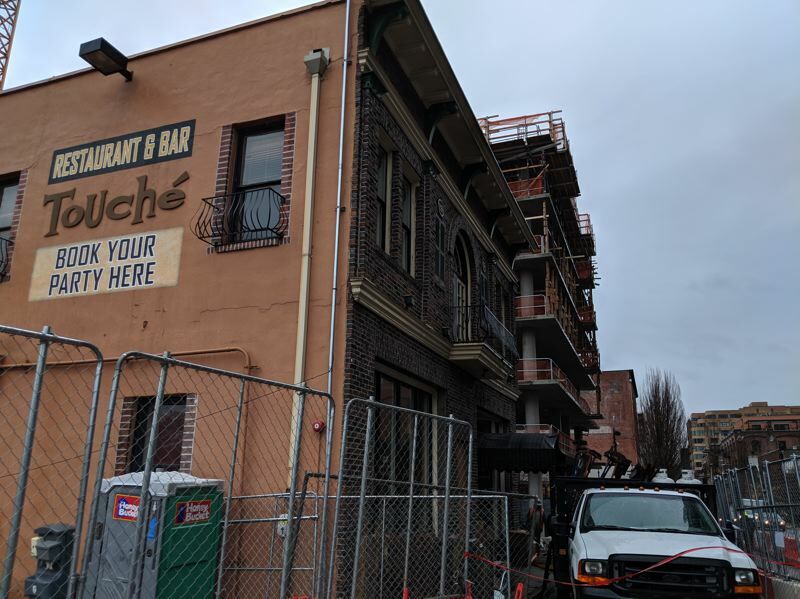 Zoning code (section 33.445.510.B) allows an owner to remove this resource from this listing and the demolition of the structure is allowed under the city's current construction regulations. 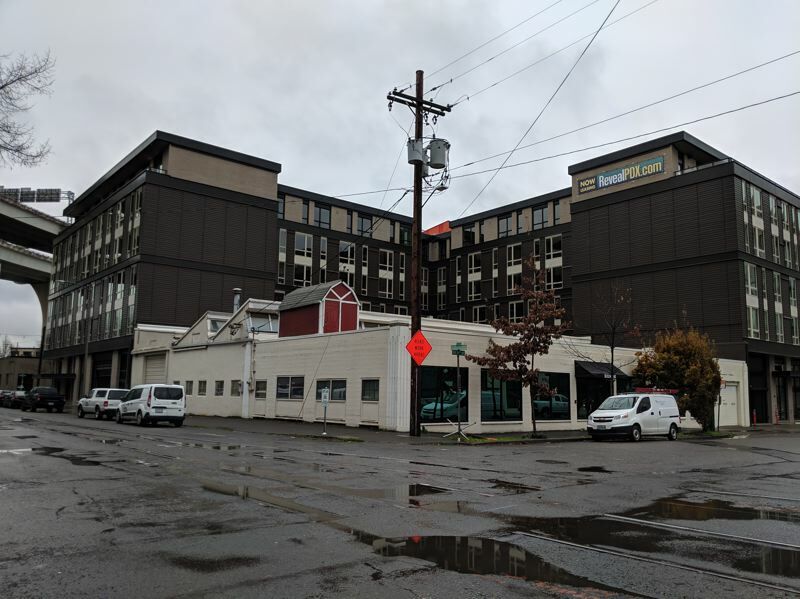 Modera Pearl, Modera Belmont, Modera Goose Hollow ... anything in Portland named Modera is probably developed by Texas-based Mill Creek Residential Trust. The SERA-designed Modera Glisan will be a 12-story, L-shaped tower with studio, one- and two-bedroom homes with an average of 715 square feet with additional live/work spaces available. It will have a hotel-inspired pool deck on the 10th floor and a 12th floor, rooftop deck. 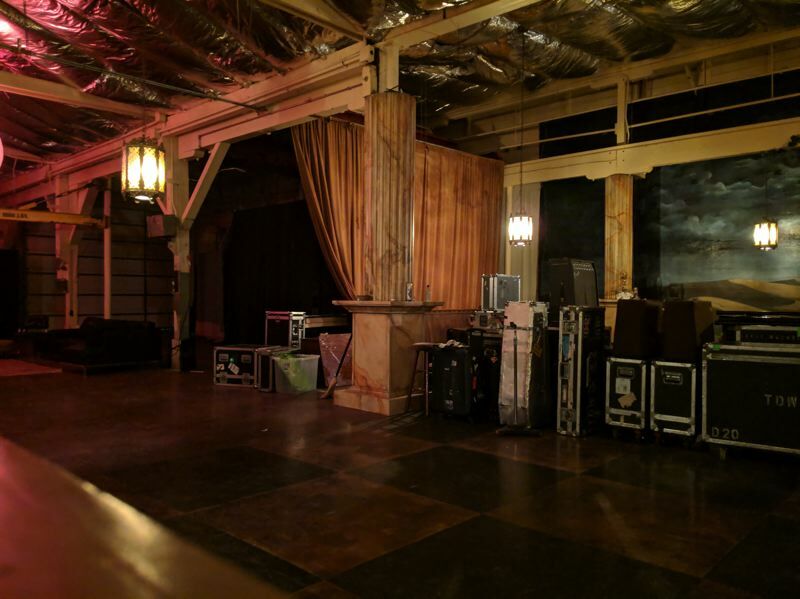 Bandleader Courtney Taylor-Taylor said he bought the 10,000 square-foot space in 2002 for $635,000 to do something sensible with money from record sales that the group might have otherwise frittered away. The one-story building's studio and hangout area has hosted many traveling musicians, including David Bowie, the White Stripes and Motley Crüe's Tommy Lee. Inside, it's Fellini-esque, with Doric columns, a stage, a recording studio with shag carpet and log-slice stepping stones. From the outside, however, it is quiet, with blacked-out windows and no sign. On the roof it has a basic patio — chairs, table, fairy lights — and a shed. Some days, after 4 p.m. a neon sign saying "WINE" comes on. 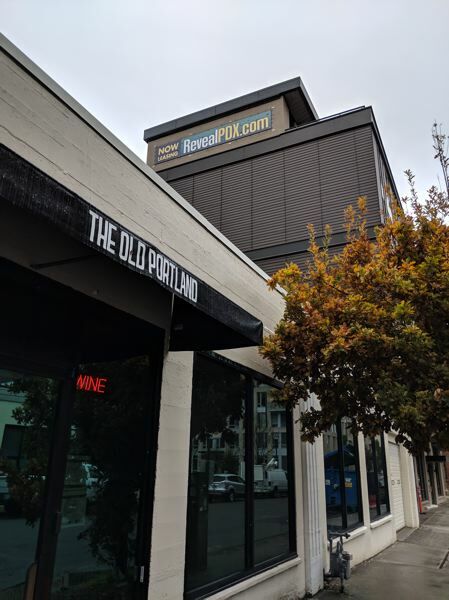 In 2017, Taylor-Taylor opened a wine bar in the front called The Old Portland, (1433 N.W. Quimby St., 503-234-0865) which sells mostly French wine (his preference) and closes at 9 p.m. because he doesn't want to deal with typically exuberant bar hoppers. It's decorated with fixtures from Old Portland places that didn't make it, like the Lotus's mirror and Satyricon's marquee. 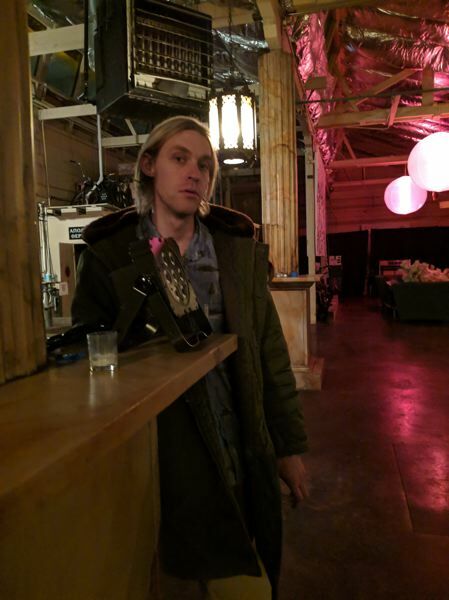 The band still plays the Crystal Ballroom every December, but the party for a new album — in this case, 2018's "Why You So Crazy?" — will always be at the Odditorium. Property developer and builder Alliance Residential would have had an easier time building on the whole block — like the new buildings all round them — but the band refused to sell. However, when the former trailer parts warehouse at 14th and Quimby was being demolished, the Odditorium's roof began to sag. Surveyors has not noticed that the two buildings shared a structural wall. In the end, Alliance had to re-engineer the west side of the apartment complex to make sure the Odditorium didn't collapse. Inside, You can see the Reveal's grey steel tie-backs. They're at the top of the blue green mural which the band had commissioned years ago, when they spent their music video budget on a remodel. As Taylor-Taylor told Willamette Week in 2017, he's looking forward to hundreds of metrosexuals moving into the Reveal who will probably want some place nearby to drink wine. "We're holding out," says bartender Chris Thompson. 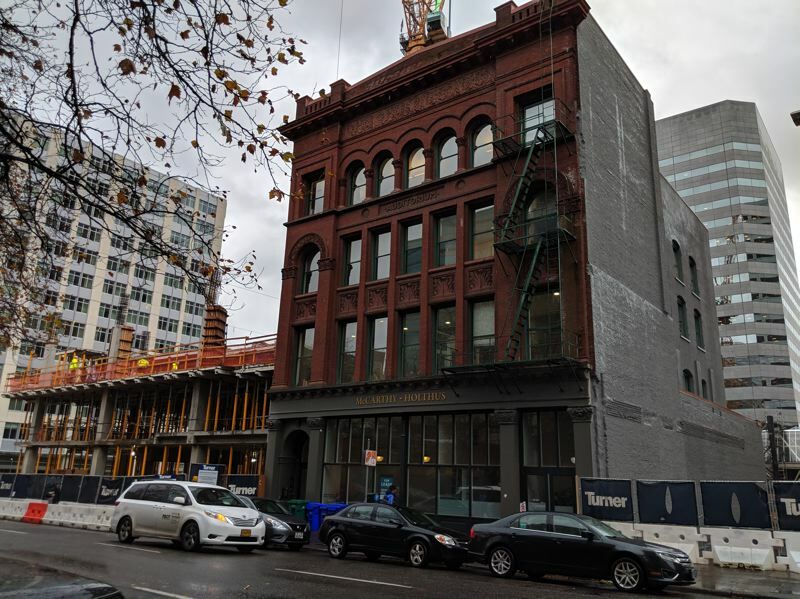 The Workman's Temple building, which was on the Second Avenue side of the block, is gone, demolished because the old brick was too expensive to retrofit for earthquakes. 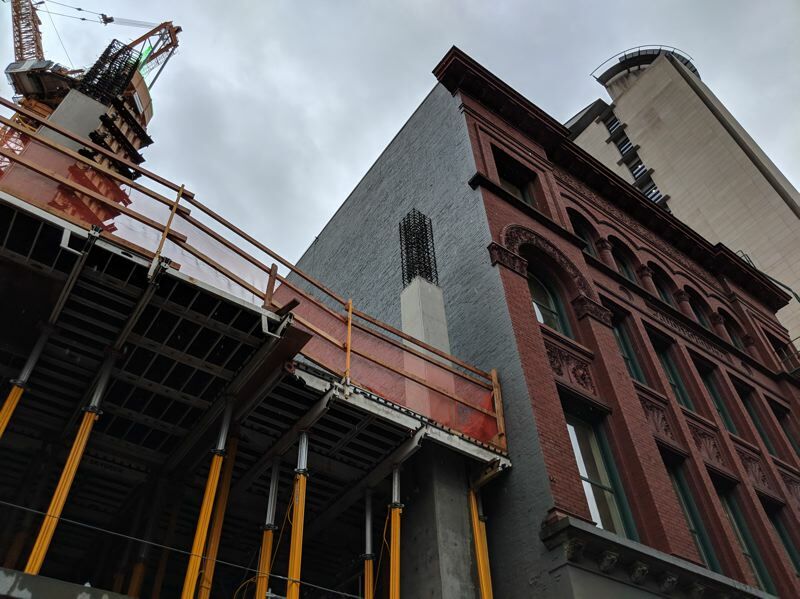 "It's protected in full, from any substantial design changes or additions," he told the Business Tribune. Add to that the fact that it's under separate ownership from the rest of the block and there was no chance of it going away. Great's client ,Third and Taylor Development LLC, owns seven eighths of the block — but not that eighth. "More often than not (with historic buildings) the drawings have been lost for decades. You don't know what you're going to see until you tear a wall down. You can be surprised." The new buildings can't go over or under the old one. There are cornices that hang out on the north and south edges, and the new buildings will have to step back a few feet from them. 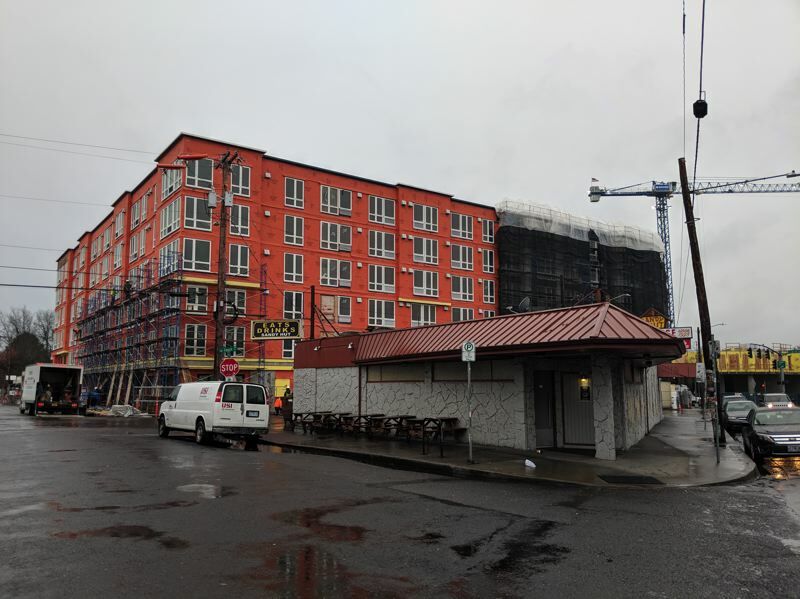 "We took care accommodating the cornice that pushed into our site," says Great, explaining that Ankrom Moisan couldn't design up to the property line. 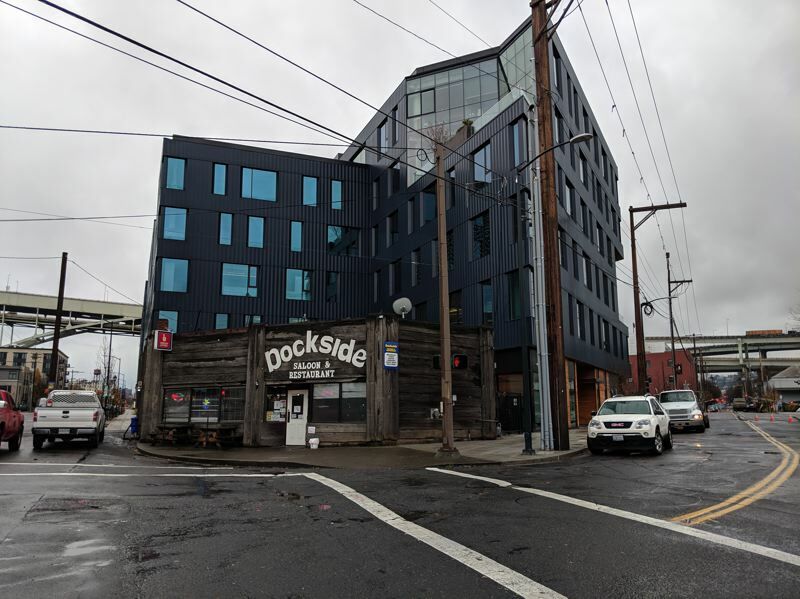 Both new buildings were subject to design review: in typical Portland style they have to "fit in" with the old building they dwarf. "In the end, it resulted in two great buildings. It's going to showcase the Auditorium building really well; people will notice it more."